The development of the closed, hydrophilic membrane is based on bionic research into amphibian cutaneous respiration. 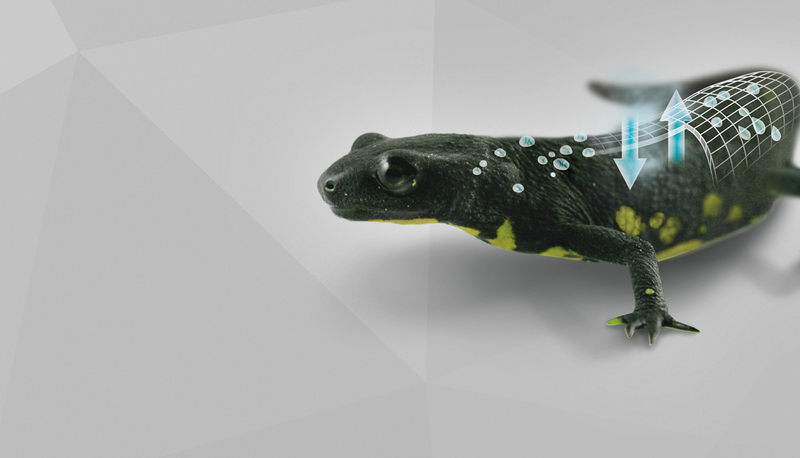 The structure of an amphibian’s skin, developed over millions of years of evolution, provides the starting point for the symbionic™ membrane. Conventional membranes are open – that is they have holes that allow only a limited volume of water vapour to escape. The higher the air humidity, for example when it rains, the less effective they are – not to mention what happens when the holes become blocked. On the inside of the membrane, symbionic™ applies a structure that leads to a huge increase in the surface area. This serrated nature of the inner surface destroys the surface tension of the sweat drops. Both these properties promote very rapid absorption of sweat in high volumes. During phases of intensive perspiration, the membrane temporarily stores the moisture. This is then ducted to the outside by means of the body heat on the inside of the jacket, which acts like a motor where then, on the outside, the sweat is able to evaporate. This keeps the jacket dry on the inside at all times. symbionic™ jackets are, of course, absolutely waterproof and windproof on the outside.